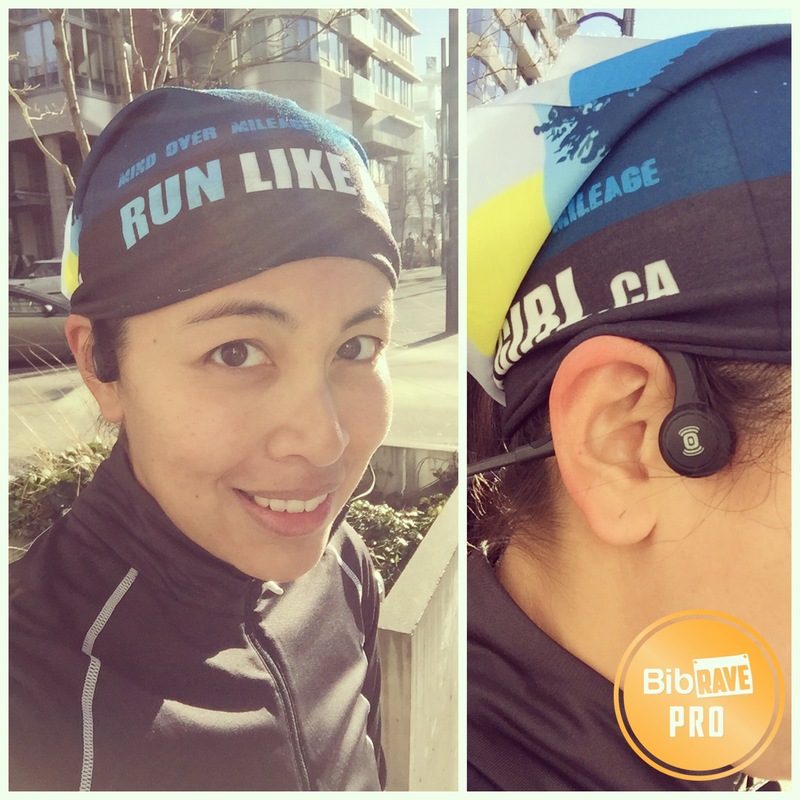 Disclaimer: I received a pair of Aftershokz Sportz Titanium Headphones to review as part of being a BibRave Pro. Learn more about becoming a BibRave Pro (ambassador), and check out BibRave.com to review find and write race reviews! I’m very picky with headphones. I’ve always loved noise cancelling in ear headphones. While noise cancelling allows me to be one with my music, it could be potentially dangerous while I’m out on the road. It’s easy to get lost in the music and not be able to hear cars about to speed by you or drive at you. Safety is my number 1 priority when it comes to running. 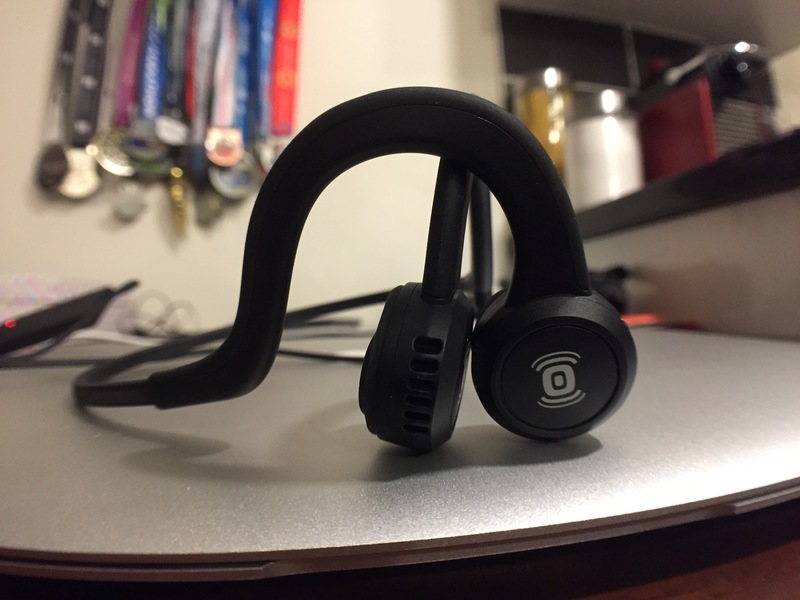 Aftershokz‘s aim is to deliver great quality sound while helping keep athletes aware of their surroundings. It seems they have succeeded. The headphones sit on your cheek bones rather than over or inside your ear. It uses bone conduction technology where vibrations bypass the eardrum and go straight to the inner ear, via your cheekbones. It’s fascinating technology and it works. For more information and detailed specs on the product, click here. When I first saw them I thought they looked a bit awkward. I had to fiddle with them to get the position right the first few times but once I was out on the road, I forgot I even had them on. They fit snug and didn’t move. I can wear it underneath my Buff but the rear band gets in the way and the Buff doesn’t quite cover my ears. Maybe I just have to play around with it a little more to find a better compromise that doesn’t leave me with frozen ears. I was very, very impressed. I clearly hear my music and what’s going on around me. When my surroundings were really loud, I did have to turn it up really high, but that’s normal. On phone calls, the noise cancelling mic worked really well. The sound was crystal clear from both ends and the other person couldn’t hear the loud traffic noise from where I was. 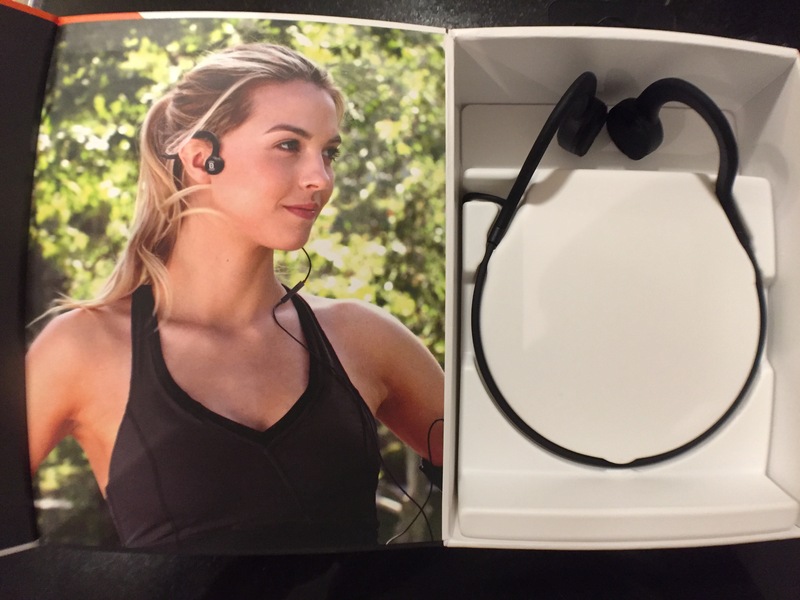 The headphones are also sweat and water resistant. I haven’t tested them on a torrential downpour but in light snow and rain, it fared well. No changes in sound quality. 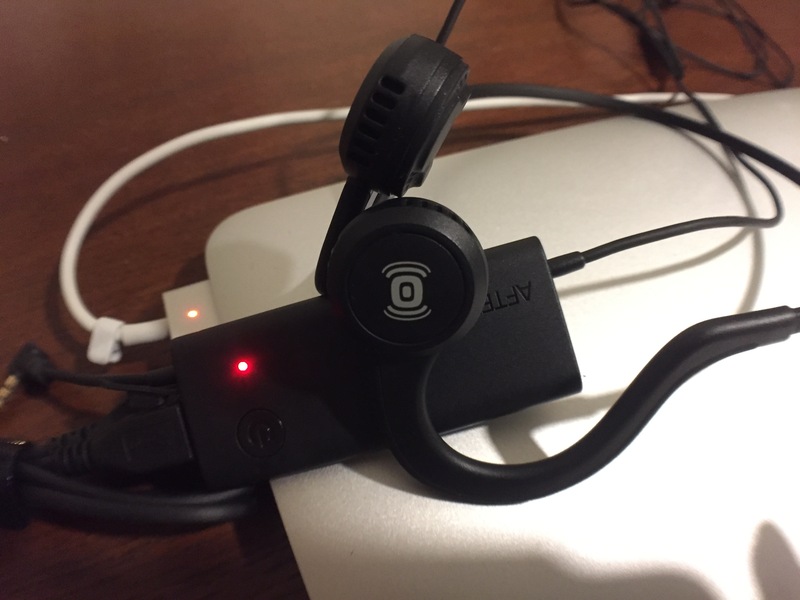 Charging – I’ve never had to charge headphones before so that’s an extra step I have to remember. They do say it will work for 12 hours per charge and so far so good. It comes with a USB cable which you can plug into your computer or USB wall charger. Turning it on and off – again just an extra step for me, no big deal. The thin cable – it’s thin and looks fragile so I have to be extra cautious with it. I’ve had bad luck with headphone cables in the past, hopefully these are more durable. I do like the length of the cable though, not too long and not too short. I had my phone in my Spibelt and it wasn’t tugging or dragging. The power module – if you’re one of those people that thread their headphones through a small hole inside their vest or jacket, this rectangular module will not fit through that hole. I just kept the phone in my front vest pocket and stuffed the cable in the same pocket. 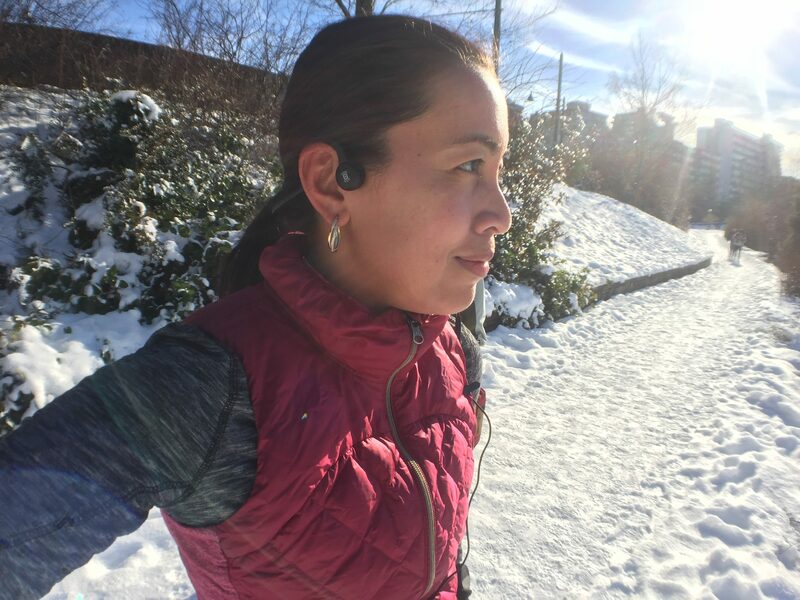 The rear band – I don’t notice it while walking or running but I do notice it when I lean my head on a wall (while I’m on a train or bus) or need to flip my hair back. It gets knocked around and I find it really annoying to adjust. Buy a pair, get a water bottle! Visit this link and get a free stainless steel water bottle with your Aftershokz Sports Titanium purchase. It’s $59.95 US, comes in 2 colours (onyx black and ocean blue) and great news, it’s free shipping to the US and Canada. 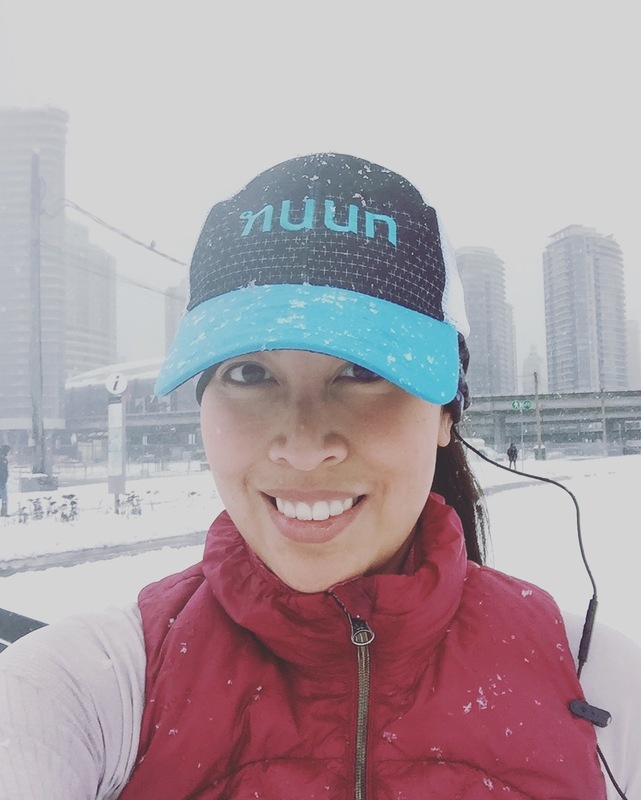 They also have a 45-day money back guarantee, but if you’re like me, you’ll fall in love with these after your first run.